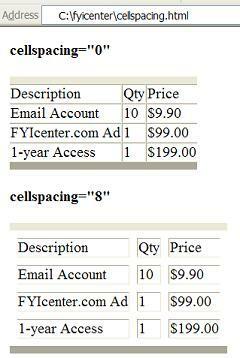 White spaces between cells refer to the vertical space between a upper cell and a lower cell in a table column, and the horizontal space between a left cell and a right cell in a table row. If inner borders are turned on, white spaces between cells appear outside cell inner borders. By default, browsers give white spaces of 1 pixel between cells. <table cellspacing="1"> - Sets white spaces between cells to 1 pixel. <table> - Sets white spaces between cells to 1 pixel. <table cellspacing="0"> - Turns off white spaces between cells. <table cellspacing="8"> - Sets white spaces between cells to 8 pixels.